Chancellor, Vice-Chancellor, honoured guests and graduands, it gives me great pleasure to be presenting today Alan Gifford, for the award of Honorary Master of the University. Alan’s career in welding and quality management has spanned more than four decades. 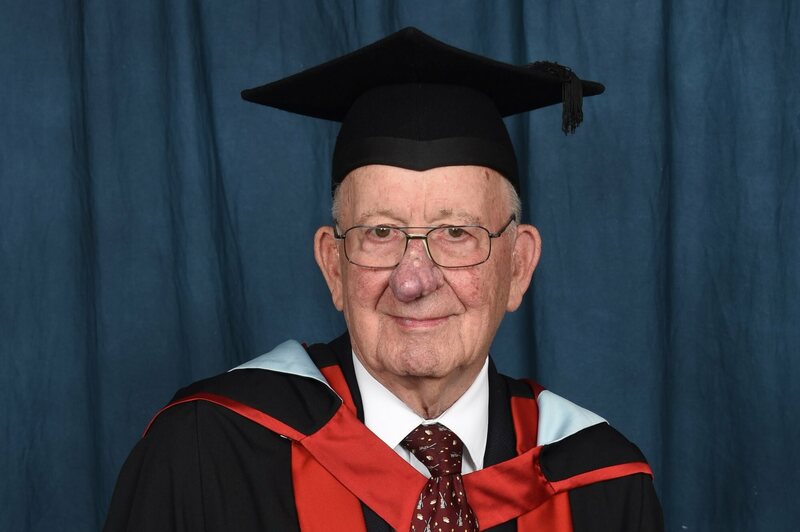 He began working in the laboratory at International Combustion Limited (ICL) on Sinfin Lane in Derby in 1950 and retired from his role as Quality Manager at ICL in 1993. Alan played a key role in ICL’s glory days as Chief Welding Engineer, engineering thousands of welds for mega-structures throughout the world including power station boilers and nuclear installations. Working with huge welded pressure vessels, up to four inches thick and weighing up to 450 tons, and boiler drums of 6 inches thickness and up to 100 feet in length; Alan was indeed managing welding requirements on a massive scale. Born in Derby in 1929, Alan attended Bemrose Grammar School. He obtained his professional qualifications through part-time day study at Derby and District College of Technology and qualified as a metallurgist whilst working in the ICL laboratory. In 1960 he became Chief Welding Engineer and in this role he introduced innovative new welding techniques to the company. He supervised the introduction of the then little known techniques of Tungsten Inert Gas (TIG) welding, Metal Inert Gas (MIG) welding, stainless steel weld surfacing for pressure vessels, and also Electro-slag welding. This leap in production welding techniques contributed to Alan receiving the Welding Institute Larke Medal in 1977. In 1978, Alan was appointed to the post of Chief Metallurgist of Northern Engineering Industries (NEI), which had by this time become ICL’s parent company, although he was still based at Derby. Using the skills he had developed he headed up a group of specialist engineers, metallurgists and welding experts whose technical assistance was sought by NEI companies throughout the world. The team provided comprehensive technical support in the fields of welding, fabrication, materials science and overall quality assurance. They worked with a wide variety of products including cranes, bridges, mining equipment, wind turbines and even road concrete mixers, but regardless of the application stringent quality standards were always applied. Alan’s many and varied projects included the rectification of two 180 tonne cranes at the Swan Hunter’s Newcastle shipyard, and a ‘Syncrolift’ system capable of lifting ships many thousands of tonnes in weight in Alaska. These engineering projects were hugely significant for the shipbuilding industry both at home and in the United States. Alan returned to work for ICL in 1988 where he took up the role of Quality Assurance Manager and introduced new concepts of companywide ownership of quality, by everyone, in all business operations. Alan’s lasting legacy to International Combustion Limited was the impressive quality ethos that he established there, which endured well after his retirement and served as an example across the industry – of which he should be extremely proud. During his career, Alan played a key role at the Welding Institute – the leading body for the registration of professional engineers. He served on their main Council, many sub committees, and helped introduce formal quality systems into international welding operations. It is worth noting that Alan has recently celebrated a milestone 60-year membership of the Welding Institute. In 1992 he received a Distinguished Service Certificate from the British Standard Institute, having served over 25 years on various committees. Since retiring, Alan has continued to apply his skill and expertise and played a key role in the project to restore Heage Windmill. Built in 1797 and restored in 2002, it is the only working, stone towered, multi-sailed windmill in England. He was a founder trustee of the Heage Windmill Society, a charitable trust. The Peak District and Derbyshire Excel Awards named him ‘Best Volunteer’ in 2011 for his involvement in the restoration. Heage Windmill has become one of Derbyshire’s gems – an important historic landmark in the region and a popular attraction with children and adults alike. Chancellor, in recognition of his achievements in the field of welding and quality management, his impact on manufacturing and his voluntary work in the region, we are delighted to award Alan Gifford the honorary degree of Master of the University.